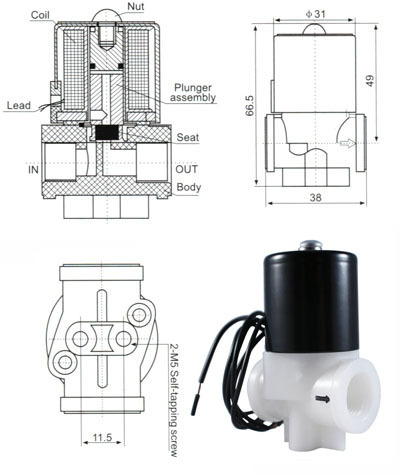 Model RSC-1 of our plastic valve line is a two-way, direct acting valve with a normally closed operating position. This means that there are two ports in which media flows and the valve will open when energized to allow media to pass through. Taking the energy away from the valve will close it and stop the flow. It works across various media such as water, air other low viscosity fluids. The port size is 1/8” inch female NPT threaded. The orifice size is 2.5mm and CV value is 0.21. It can withstand pressure up to 115 psi (8 bar) and temperatures as low as -5 C and as high as 90 C. The seal material is NBR (Buna-N) or Nitrile Butadiene Rubber. Been buying these for years and have never had a failure. I use them for air control. Ordering the 1/8'' 12V DC Electric Plastic Solenoid Valve was easy and the delivery was fast. With a couple of quick connect fittings from the local hardware store and simple electrical connections, my Trawler has it's wiper water system back on line. This valve is great for small hobby projects. I found that it can be activated with a simple 9V battery and it retains air pressure very well. It has a extremely fast reaction time (a fraction of a second). I used this valve as part of a compressed air powered air-soft gun. It has functioned superbly. Its only down side is that it can only retain around 115 psi.